How to finish the UVM Test? The way “UVM Hierarchical Sequences” works? What is a Configuration Object in UVM & What is its utility..?? We heard about “Configuration Object“ and its usage/requirement in many places inside an UVM based Verification Environment. So today I’ll try to introduce about the concept of “Configuration Objects” & What is the utility behind using a Configuration Object inside an UVM Testbench. As shown in my previous post, named as “UVM Components“ – there are static and dynamic components as part of the Testbench. Among those static components, UVM Architecture contains an important physical component that is called “Agent“. UVM Agent can be thought of as “Verification Component” dedicated for a specific logical interface to the DUT. An Agent fundamentally contains the Driver, Sequencer & a Monitor. In addition, it may also contain the components related to functional coverage monitors or Scoreboard. 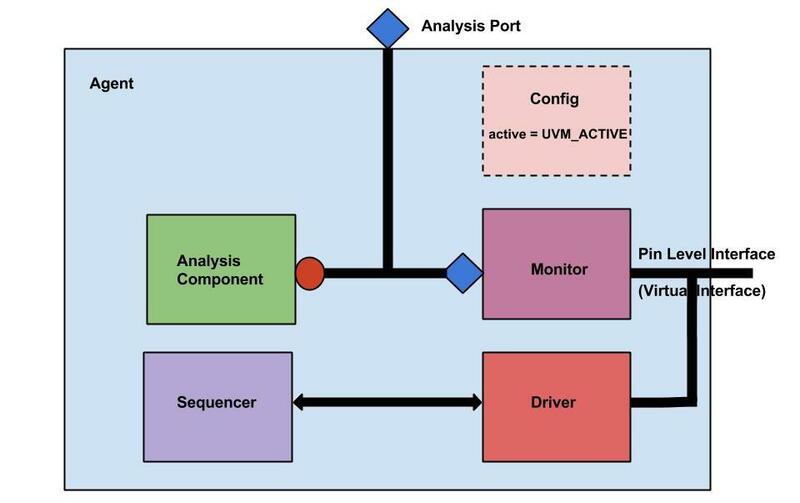 An Analysis port used to be present on an Agent which is connected to the analysis port on the monitor which makes it possible to connect any external analysis component without the knowledge of Agent’s implementation. The most important part is – the structure of an Agent is dependent on its configuration. Configuration can differ from one test to the another using a different configuration object for the same Agent. So we can say that “Configuration Object” places a very significant role in the structure of an Agent. Let’s see what all kind of details can be contained with-in a configuration object of an Agent. The handle of the virtual interface for the Driver and Monitor to interface with the DUT. Functional behavior/configuration of the Agent. As per UVM convention, any Agent can act in ACTIVE or PASSIVE mode. In ACTIVE mode, Driver and Sequencer are constructed, yet in PASSIVE mode neither Driver nor Sequencer is constructed. Usually in PASSIVE mode, a Monitor is constructed. Selection between ACTIVE or PASSIVE mode of an agent can be done by a parameter named “active” which is a variable of enum type uvm_active_passive_enum ( with values as UVM_ACTIVE & UVM_PASSIVE). Default value of active is UVM_ACTIVE. The use of virtual interface using the Configuration Object has been shown in very details in one of my post called “Application of Virtual Interface and uvm_config_db“, please refer it for detailed explanation. To find out the functional coverage related to the Agent’s functionality, there may be a functional coverage monitor implemented as a sub-component of Agent or may not. It depends on the Testbench Architecture. The good part is – this behavior is controlled using a bit type variable named “has_functional_coverage” (meaningful name) inside a Configuration class/object that is being used for that Agent (We’ll see the application in the written UVM Configuration class code). Configuration object also plays a significant role in defining other features of the Agent & how an Agent behaves or configured with respect to certain testcase/scenario generation. Interesting thing is – different test mode can easily configure Agent as per the configuration needs. For example, in case of APB bus – configuration object may have variables to define the memory map and determining which PSELx lines will be activated for which addresses. In the provided code below, it is shown how a configuration class i.e. “ahb_master_config“ contains different variables which impacts the Agent configuration on the fly when configuration object propagated from the top by the testcase. Configuration object i.e. “m_cfg“ once received successfully inside the build_phase of Master Agent, it helps to decide the construction of the Agent’s sub-components and connections between built created sub-components. With that, I conclude this blog, introductory information on the Configuration Object Concept in UVM and its utility/application in the UVM Testbenches. I hope you found it useful & helpful, please feel free to provide your feedback & suggestions for new topics. This is all good information ! One suggestion though, if you change the font where the code is , it would be much better to go through. Italicized font is not so code-like. My question is wrt “get” here. where is “set” mentioned is it not required/mandatory ? “set” is definitely required. Usually it is done from the test. Added the code to show the uvm_config_db::set usage. nice explanation about configuration files. Enter your email address to subscribe to this blog & receive newly released post's notification by email.